I am loving the rugby. Even if, in all honesty, half the time I do not really know what I am watching. The other half I understand enough to appreciate the game. I am sure somebody has conveniently posted rules in some web site somewhere; but who really wants to read? First of all, the ball is not round. It is shaped like a large plum and bounces this way and that unlike a proper round ball. It is probably shaped that way because that makes it easier to carry in one’s arms. Thereby lays the game’s great paradox. 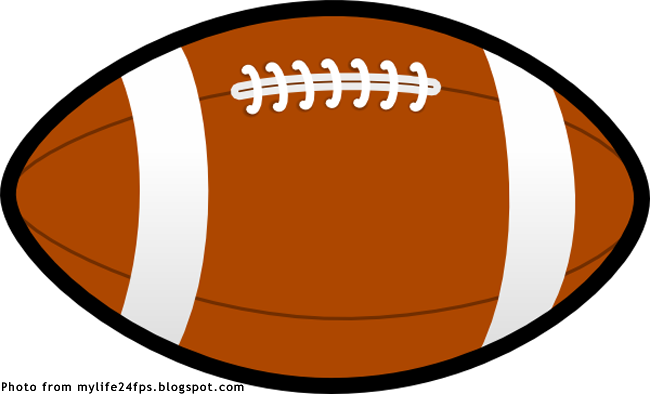 It is supposed to be a variant of football; yet most of the game is played with the hands. Go figure. It has been said that rugby is the only game for which you have to pass backwards to go forward. Pretty stupid, eh!? It works, though. 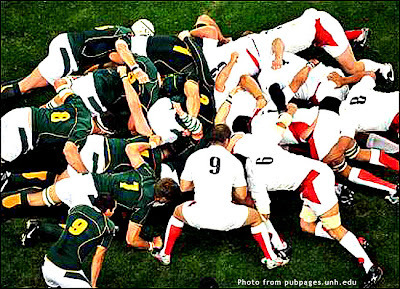 Team-mates hang behind the player in possession so that they can receive the ball if he so decides to offload it. I know that those two posts that look like satellite transmission towers are also called – like in soccer – the goals. Unlike in soccer, though, you have to put the ball above what looks like the crossbar to score. There is also no net. So, sometimes it takes a while for the officials to figure out if the ball passed between the posts. Unlike in soccer, for which scoring is pretty straightforward, scoring in rugby is a tad more complicated. You would imagine just because there are goals that the object of the game is to score by putting the ball through the goal. That is not always the case. The best way to win a game is still to accumulate points by bringing the ball across the bye-line or the far end of the opponent’s defensive half of the field. This is called a “try.” A team that completes a try gets awarded 5 points. Sounds simple enough; except that there is the little matter of fifteen frightfully large men standing in your way getting ready to break every bone in your body if you tried. Maybe that is why it is called a try. I would not know. I am the soccer fan. If a try is scored, a team is given a free kick depending on the location where the ball was put down on the ground when the try was completed. If the ball passes between the twin posts, then another two points are awarded. Sometimes, a referee spots a foul and awards a penalty to the attacking team. This is the most mystifying part for me. The referee blows his whistle; the commentators cry, “Penalty!” All I see is a pile of Shrek-like men tearing into each other. So, I just wait for the penalty kick to be taken and do not bother to figure out what it was given for. Who knows what these burly men are grabbing of each other beneath that pile? In soccer, penalties are pretty straightforward. The kick is awarded if the foul is committed inside what is called the penalty area. The ball is placed on a spot 12 yards from goal and everything is relatively easy to figure out even for those who are new to the game. In rugby, penalties are taken from all sorts of absurd distances and angles. If you think soccer players can kick, well, you just gotta see these rugby players! Then there is the drop-kick. Everyone rushes this way and that; and then, just when you expect everyone to go rushing for the bye-line, somebody suddenly drops the ball on the floor and kicks it goal-wards the moment it hits the grass. If it passes between the posts, three points are awarded. Hard enough to do with a round soccer ball; unbelievable with that large plum. There is also this thing that is called the scrum. The best way for me to describe it is as an organized gang brawl for which no fists are thrown. Really! Why this is done and why the referee calls for it is as mystifying for me as the penalties he awards. It is fun to watch, though – big men arranging themselves into something of a battering ram trying force the other side to submission. Although the game is not as free-flowing as soccer – there is a stop-go to it that is similar to basketball – it can also be fast and furious when it gets started. I find myself on the edge of the couch when the player with the ball is just yards away from the bye-line; and often, even this close to a try, the attacks can be successfully defended. It is hard to even conceive that rugby and soccer share the same roots. The latter is universally more popular and contains more elements of grace in flow and movement that the former just does not have. That said, that utter lack of grace of rugby and even its sheer brutality is fascinating to watch. It is not for everybody. In soccer you can have a slight frame; in rugby, if you do, you will end up at the coroner’s. Some of the tackles just simply make me shudder because of their sheer ferocity. In spite of that very ferocity, altercations between players are few and far between. I even somehow feel ashamed when I think of the histrionics that many professional soccer players are capable of in comparison. If and when these altercations break out, these are quickly ended by the ever-polite referees. “Step back, please!” What these referees say into their microphones are also transmitted into television sets the world over. This politeness in what – to a certain extent – can be said to be a savage game is really, really a breath of fresh air. Players also do not feign injuries, unlike in soccer. In fairness, once upon a time, professional soccer was also played by men instead of actors. These days, I feel distressed when I see a highly-paid professional soccer player go down seemingly in a heap of pain; only for replays to later show nobody even touched him. 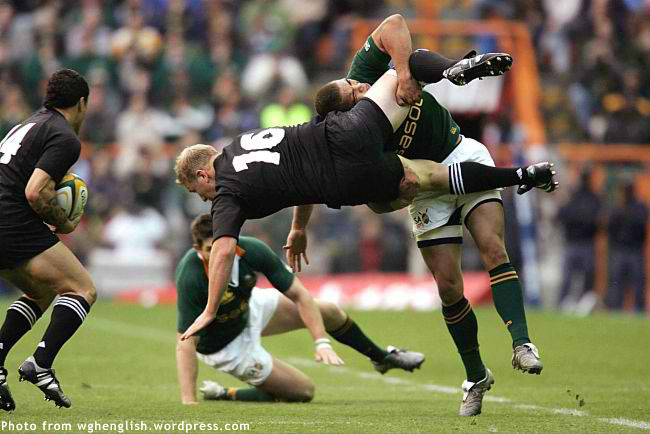 In rugby, it is legitimate for an opposing player to catapult himself into the player with the ball like some sort of human torpedo. You have to see to believe. Yet, the player who gets hit, more often than not, simply dusts himself and gets up with a minimum of fuss. It is legitimate to grab an opponent anywhere below the shoulders and throw him to the ground. The pulling of shirts and shorts is also permissible. Players get cut up and bloodied with amazing regularity. If they do, they either get substituted or hurriedly patched up. No fuss; as it used to be in soccer before the age of gamesmanship. When the referee blows to end 80 minutes, players of both teams come together as though what just finished was a game of billiards instead of an extreme and physically challenging game. They shake each other’s hand or hug each other like true gentlemen and sportsmen do. Hard to believe that they were trying to break each other’s bones just moments before. I do not think there is a chance in hell that I will switch allegiance from soccer to rugby – and it is a little late in the day to begin with – but I have been enjoying the Rugby World Cup matches in New Zealand. I do not think rugby will ever match the flowing beauty of soccer as a sport. 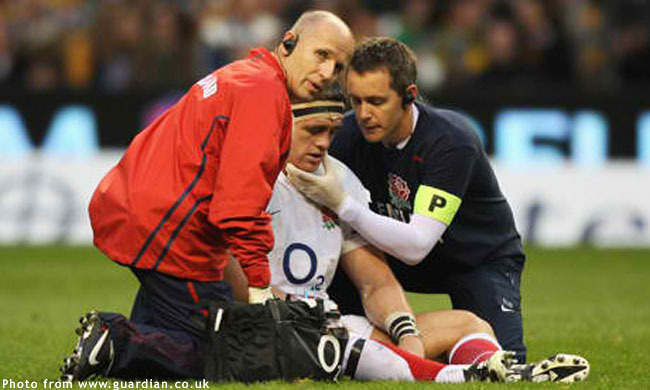 However, it is the integrity and honest endeavour of rugby that I wish professional soccer has more of. Just watch the classic soccer matches on television. Once upon a time, professional soccer players were not the vomit-inducing cheats some are today. Not all, in fairness; but enough. Younger generations will not know the difference; but professional soccer was so much better when players just simply got up and got on with it.